Special effects for weddings can truly add a zing to the wedding photographs and videos. While ordinary pictures are very last century, weddings with special effects, edited in locations and amazing details are becoming the current trend. If you are scheduled to get married, or know someone who is getting married either in your family or friends circle, remember to suggest that they opt for a special effects package with Rachnoutsav Special Effects for a fantastic and magical rendition of their weddings. Not only is it extremely attractive, but also makes the memories more special in every way possible. Special Entry Packages: The arrival of the bride and the groom with aplomb is the most anticipated moment in any wedding. With Rachnoutsav, the bride and the groom can plan a unique and stylish entry for their wedding which will undoubtedly catch eyeballs. Ice Figurines, Fountains and Carvings: If you are looking for something fresh and yet beautiful, fountains are an ideal choice for weddings. Especially for those weddings which are held outside, fountains can lighten up the entire area and give it a classy look. Similarly, Ice carvings and figurines can also be made, catered specifically to the tastes and cultures of the wedding party adding a crystal-esque look to the wedding. Fire: One of the most important aspects to consider while adding pyrotechnic effects to an event is ensuring safety. Rachnoutsav ensures a magnificent display of pyrotechnics usually in the form of fireworks without compromising on any aspect of safety. Confetti, glitter and steamers: Confetti, glitter and streamers, which can be programmed to explode at a particular time during a wedding can truly add some pizazz to the wedding. Especially if caught on video, the effects of a glitter ball or streamers can be phenomenal. Rachhoutsav offers unlimited options on confetti, glitter and streamers that can be added to the wedding depending on the needs and preferences of the couple. 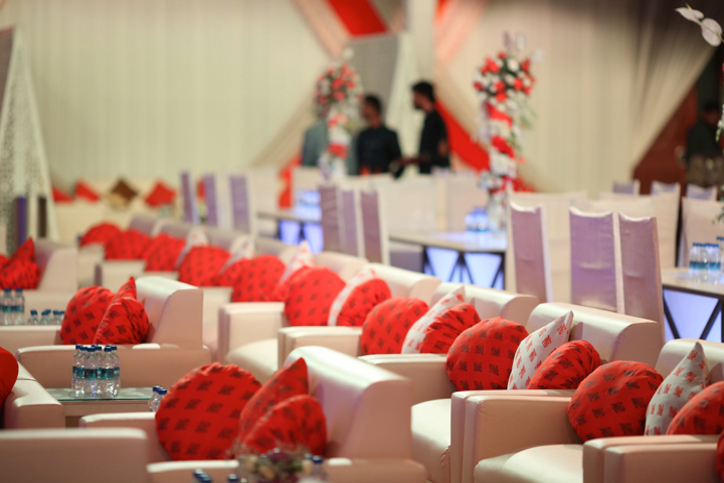 Undoubtedly, everyone wants their wedding to be a stand out wedding. If you want your wedding to be unique and on the minds of people long after it is done, consider Rachnoutsav’s special effects package for your wedding and see the difference yourself on your special day!